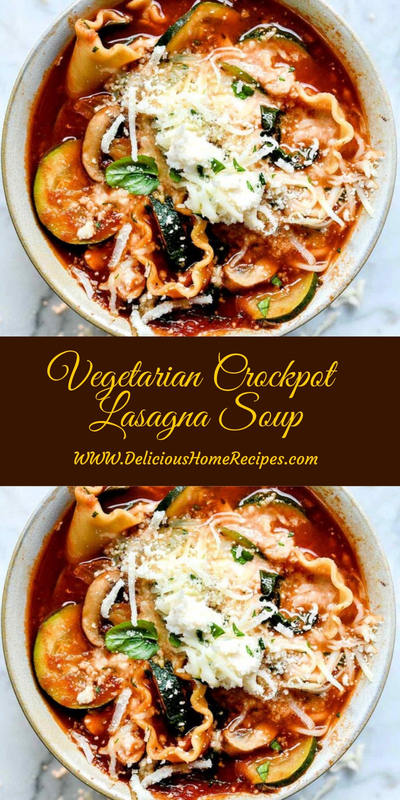 To make the soup even simpler to make while coordinating the fam’s busy schedules, I took this vegetarian lasagna soup from the stove to the crockpot for cooking with ease. Slow cooking makes it easy to make any night of the week, and it can be made with the slow cooker function on the Instant Pot too. The flavors of lasagna soup are really analogous to regularized pasta, right in a solon slurpable organise. The soup starts with several of my favorite European products from DeLallo, one of my long-time, most dearie partners here on the blog. Avoid cooking the noodles in the crockpot with the sauce from the beginning of the cooking time. It will make the noodles absorb too much of the tomato sauce and become gummy. Instead, cook the lasagna noodles separately (undercook them slightly) and add the to the crockpot at the end of the cooking time to flavor. Heat the olive oil in a non-stick skillet over medium heat. Add the onion, garlic, and brown mushrooms, and cook until the begin to soften, about 4-5 minutes. 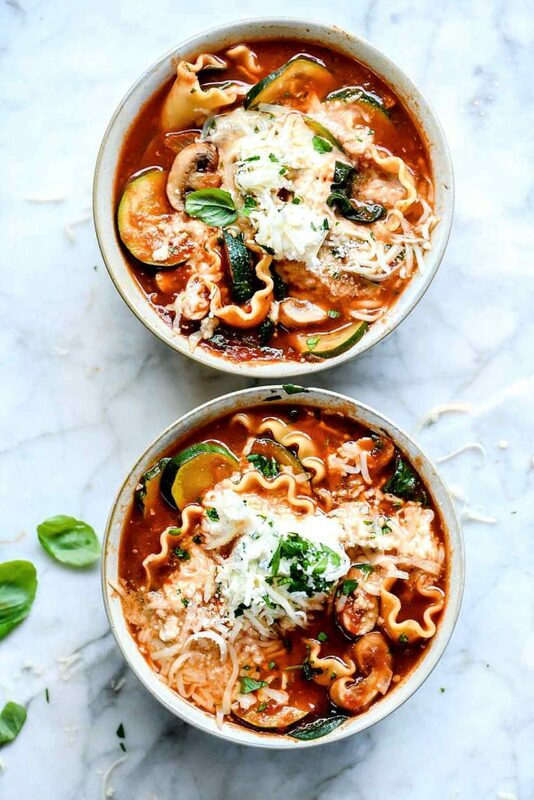 Add the onion mixture to the insert of a 6 quart slow cooker with the zucchini, crushed tomatoes, tomato sauce, vegetable broth, bay leaves, basil, oregano, red pepper flakes, kosher salt and black pepper. Set the slow cooker on low and cook for 7 hours or on high and cook for 3 1/2 to 4 hours. Once the cooking time is done, cook the lasagna noodles according to the package directions, drain, and add to the soup. Cut them into smaller pieces if you’d like. Add the spinach and warm until wilted. Mix in half of the ricotta cheese mixture. 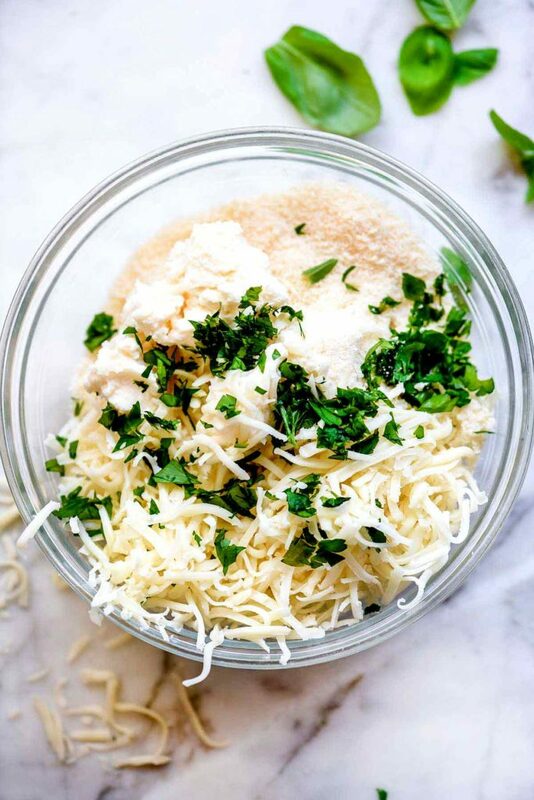 Ladle into soup bowls and top with a dollop of the remaining ricotta cheese topping and sprinkle with more parsley and basil.